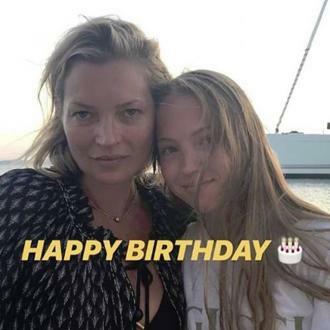 Supermodel Kate Moss showed off her comedy skills for the Love Actually sequel by joining Andrew Lincoln for an update of his famous romantic gesture in the hit 2003 film. The Walking Dead star's character Mark showed up on Keira Knightley's doorstep once again as part of the 10-minute short Red Nose Day Actually and reminded her it was the Comic Relief telethon - all via messages scrawled on poster boards. He concluded the magical moment by reminding Keira's character Juliet of his plans to marry one of a handful of top models. Moss, who was one, then stepped into the shot to say hi to an astonished Juliet - also using handwritten billboards. The Richard Curtis film, made especially for Britain's Red Nose Day charity marathon on Friday (24Mar17), also featured Hugh Grant, returning as The Prime Minister and nursing a broken arm after falling downstairs at 10 Downing Street while dancing to Drake's Hotline Bling, his wife Martine MCCutcheon, and Bill Nighy, who reprised his old rocker character Billy MACk and revealed his beloved manager from the 2003 film had died after suffering a massive heart attack. In fact, Scottish actor Gregor Fisher, who played Joe in the original film, is still alive and well. The sequel also gave fans an update on Colin Firth's life with his Portuguese wife Aurelia. In the short film, the pair has three kids and Firth is still trying to master his partner's native language, but when she explains she is pregnant again, he believes she's talking about dinner. The most magical moment of the Love Actually update came when grown-up child star Thomas Brodie-Sangster surprised his movie dad Liam Neeson with a visit and the news his character, Sam, had met up with the school friend he doted on in the 2003 film in New York. Olivia Olson, who played the girl in the movie and sang Mariah Carey's classic All I Want For Christmas is You also appeared to ask Liam's character Jamie for his son's hand in marriage. The sweet sequel closed with Grant's Prime Minister optimistic for the future thanks to things like Comic Relief, which annually raises millions for charity via donations from the British public. He said, "It's not just romantic love that's all around."